Sweden Dedicated Review 2019: Is Sweden Dedicated a Good Hosting? Sweden Dedicated is a Swedish hosting company that started its operations way back in 2006. The hosting company provides data center space and cloud-based server solutions to individuals and businesses in Sweden and beyond. Sweden Dedicated is a web hosting provider with headquarters in Stockholm, Sweden. Started in 2006, the company was originally founded as a now defunct Dutch hosting company that sold game servers and web hosting solutions. In 2009, the company changed its name to Sweden Dedicated and moved all its operations to Stockholm. To this day, Sweden Dedicated does not offer shared web hosting solutions. The vendor continues to provide server solutions, including cloud VPS servers, dedicated servers, and colocation services. Sweden Dedicated operates three data centers located in Stockholm, Sweden. All of the data centers are equipped with fire extinguisher systems, uninterruptible power supply (UPS), and diesel generators. All this in an effort to provide an ideal hosting environment for optimal performance of its servers. 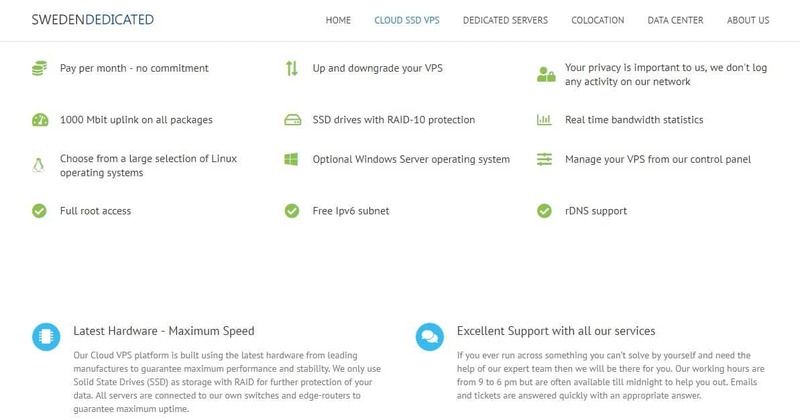 The hosting provider uses lightning-fast servers with pure SSD and SATA storage. This provides faster website loading speeds as well as maximum security. What’s more, Sweden Dedicated uses Dell PowerEdge R620 dedicated servers. These servers come with dual 8 core processors and include redundant power supply, and Integrated iDRAC7 with virtual media remote access among other features. In addition, all the servers are connected to the internet through redundant 1000 Mbit internet connections. Sweden Dedicated cloud VPS starter package comes with 1GB RAM, one core processor, and SSD disk space of 40GB. Its most advanced Cloud VPS plan includes 16GB RAM, 12 core processors, and 250GB SSD disk space. This hosting provider’s solutions offer an uptime availability of 99.9%. The vendor allows its dedicated server customers to choose their preferred operating system from a list that includes Linux, Windows, and FreeBSD OS. The prices of Sweden Dedicated hosting plans are fairly standard, especially if you consider that the hosting plans include pretty good features to suit even the most demanding websites. The prices are listed in euros. This vendor’s hosting plans come with four flexible billing cycles including: monthly, quarterly, semi-annual, and annual subscriptions. Unfortunately, Sweden Dedicated does not have a refund policy for its hosting solutions. You can reach out to the Sweden Dedicated customer support desk via ticketing system or email. The vendor also offers special phone support for mission-critical processes for its clients. The vendor has no live chat support on its website. Although the vendor says that its technical support is available 24/7, it is not as keen to respond to queries from potential customers. I sent a support email and never heard back from them. Sweden Dedicated has a knowledge base section on its website, but it is empty. Sweden Dedicated offers cloud-based hosting solutions that can handle large websites with lots of traffic. However, for personal blogs and small websites, it has no suitable hosting solutions. The vendor’s unresponsive support team is a factor any would-be customer should consider before committing to using its services. Wondering how Sweden Dedicated stacks up against other Web Hosting companies? Enter any other Web Hosting company and we will give you a side-by-side comparison.